We have seen how plants function in normal stress free environments. However, as we well know, our environment is not always so ideal. To survive, plants have, over time, developed natural defenses to aid them in this endeavor. When a plant becomes dormant, it prepares for the approach of adverse environmental conditions that are bound to limit growth or even threaten death. Entry into dormancy requires a reduction of physiological activities to the minimum necessary for survival. Typically, deciduous trees discard their leaves that would be damaged by frost, low temperatures, strong cold winds, cloudy days and snow cover. Annual plants die before the arrival of seasonal extremes. But these species survive in the form of dormant seeds that germinate when conditions become favorable for their growth. Perennials typically die back above ground with the underground portions ready to begin growth after the extremes of winter pass. Environmental extremes of a different nature dictate small plant size among native species of the arctic tundra and high on the mountains in the alpine zone. Their low, compact form provides protection against the crushing weight of snow covers in winter, and after the snows have melted, against the impact of strong winds, in their exposed habitats. Plants in any habitat constantly struggle to adjust to the changing environment. Thorns are found on hawthorn trees, blackthorn trees and pyracantha. 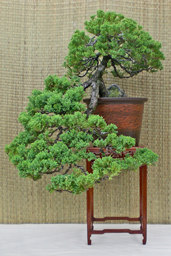 They are modified, short branches grown from axillary buds terminating in sharp, hard points. Spines, as found on cactus and hollies, are modified leaves or parts of leaves, such as projections from leaf margins. Since spines are modified branches or leaves, they develop at nodes on stems. Correctly called prickles, the rose’s protective structures are arranged in irregular patterns within the internodes. Prickles are short, woody outgrowths with many species being recurved (having tips pointing downward) Such a shape hinders small animals trying to climb the stem to reach the leaves. They also provide a secondary, supportive role, as in climbing roses where the recurved prickles become hooked on the supportive structure as well as it’s branches. This same role is played by recurved thorns like those on the stems of bougainvillea. There are two parts to the biochemistry of plants. One involves the life-sustaining chemistry of basic metabolism and includes: photosynthesis, the extraction of foods by cellular respiration and the construction of cellulose, starch, fats and proteins. Biochemical pathways branching away from these essential processes lead to the synthesis of secondary products including those that function as chemical defenses. The first of these secondary products are called tannins. The protein-binding, enzyme- inactivating capacity of tannins make them superior deterrents to insects and herbivores. They contain substances that also effectively inhibit fungal and bacterial growth. One of the most interesting of secondary products are called alkaloids. These nitrogenous substances when introduced into animals (man), have wide ranging physiological effects. They protect against predators, in part because of their bitter taste. Some alkaloids have mild or strongly addictive side effects: caffeine in coffee and tea, nicotine in tobacco, cocaine from the leaves of the tropical coca plant and opium and morphine from the opium poppy. Social problems arising from drug abuse have, unfortunately, given some plant products a bad reputation. But that should not detract from the fact that mankind’s welfare has been greatly improved by the many wonderful chemicals that plants alone are able to produce. Alkaloids, when ingested act as cardiac and respiratory stimulants, muscle relaxants, blood vessel constrictors and pupil dilators. When taken in an uncontrolled quantity, they can become more than the body can handle and often result in violent illness, coma or even death.